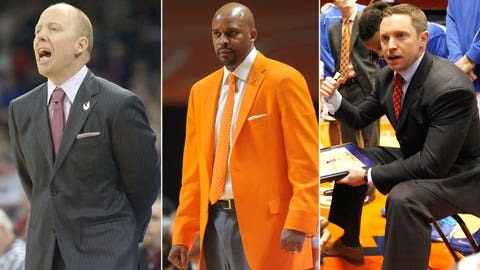 NASHVILLE, Tenn. — On April 1, Cuonzo Martin said the only place he wanted to coach basketball was at Tennessee. Two weeks later, the three-year Volunteers coach was gone, accepting the same job at California. It came after Martin guided Tennessee to the NCAA tournament’s Sweet 16 and had been offered a $500,000 pay raise and two-year contract extension by UT athletics director Dave Hart. That leaves Hart entering the coaching-search process late in the game. Already, more than 30 head coaching positions have been filled since end of the season. That includes Auburn hiring former Vols coach Bruce Pearl. "No searches are ever identical in nature," Hart said of replacing Martin, who was hired by former Tennessee AD Mike Hamilton to follow the popular Pearl. "… We will move as quickly as we can, as quickly as we reasonably can to get a replacement on board. "To what the timetable is, is often times difficult to nail down. We are late in the sense that we are right on top of signing day (last Wednesday) and the Final Four has come and gone." Initially, Wichita State’s Gregg Marshall, Virginia Commonwealth’s Shaka Smart, Minnesota’s Richard Pitino and Dayton’s Archie Miler were listed as possible candidates, but they will reportedly remain at their schools. Other names being bantered about include: Louisiana Tech’s Michael White, Cincinnati’s Mick Cronin, Xavier’s Chris Mack, Southern Miss’s Donnie Tyndall and former UCLA coach Ben Howland. Multiple reports have White, 37, at the top of Hart’s list. The former Ole Miss player and assistant coach guided the Bulldogs to a 74-31 record the past three seasons — including a share of the Western Athletic Conference (2013) and Conference USA titles (2014). He is the son of Duke athletics director Kevin White. "We would seek as a priority someone with head-coaching experience," Hart said. "That does not eliminate people, it just says that is our initial priority. We are looking for a track record. "… (But) you don’t always end there. Perhaps at the end of the day we don’t attract someone with a significant track record, perhaps we attract a rising star. I don’t know. All of that is hard to forecast." Martin was hired away from Missouri State (2008-11) three years ago — the subsequent move after Pearl was fired and banned from coaching for three seasons after violating NCAA rules. With the Volunteeers, though, Martin never really escaped the shadow of Pearl, who led UT to six straight NCAA tourney berths and the program’s only Elite Eight berth in history, before running afoul with the NCA. Martin took Tennessee to the NIT his first two seasons, before finally getting an NCAA tourney bid last month. All the while, a petition by Tennessee fans had reached more than 30,000 that sought to have Martin fired and Pearl re-hired. That was squashed when Pearl became coach at Auburn. "He knew beyond the shadow of a doubt that we wanted him to remain here," Hart said of Martin, who went 64-31 at Tennessee (124-82 overall record). Had he stayed, Martin’s salary would have been $1.8 million per year. "We offered Cuonzo a significant reward for what he had accomplished," Hart added. But did Martin feel wanted at Tennessee? Fan discontent and media questions swirled around the Volunteers, who were an underachieving club in February (16-11) before making a sustainable run in March. That included two losses to lowly Texas A&M and being in danger of missing the NCAA tourney altogether. Hart had no comment on Martin’s status at Tennessee until after the season ended with a heartbreaking 73-71 loss to Michigan in the Sweet 16 round. Before that, the Vols had won eight of nine games and finished 24-13. At his introductory press conference with Cal on Tuesday, Martin addressed the fan petition at Tennessee that wanted him fired and Pearl re-hired. "I thought that going through that, and to be honest with you, when you talk about the petition, I didn’t really hear about it until lately," Martin said. "One of (the) things when you’re a coach, you can’t be consumed with things outside your periphery. "And for me, I thought it was a great teaching point for our guys, because we always talked about having character and going through adversity and dealing with situations." Tennessee has four incoming recruits — center C.J. Truman from Madison, Ga., point guard Larry Austin of Springfield, Ill., forward Phil Cofer of Fayetteville, Ga. and and guard Jordan Cornish of New Orleans, La. — that were all signed by Martin. "We fully expect those young men to be a part of our basketball program," Hart said of the four signees. "(It’s a) tough time for everybody in terms of our current players and those signees, because right now there is a void for them. Recent Tennessee commitment Kingsley Okoroh, a 7-foot-1 center from England who played last season at Phoenix (Ariz.) Westwind Prep Academy, is following Martin to California. The new Volunteers coach will inherit a team that loses four starters. That includes the talented inside tandem of senior Jeronne Maymon (graduated) and junior Jarnell Stokes (leaving early for NBA draft). Also gone is guard Jordan McRae (leading scorer for 2013 and ’14) and point guard Antonio Barton. Key returnees for Tennessee include senior guard Josh Richardson, a member of the SEC’s All-Defensive Team, sophomore point guard Darius Thompson and junior guard Amani Moore. Martin replaces Mike Montgomery, who announced his retirement from coaching after 24 seasons, including the last six at California and previous stops at Stanford and Montana. In accepting the Golden Bears’ job, Martin was gracious about his three years at Tennessee. "I also want to thank the Tennessee basketball family for giving me the opportunity to spend three years there," Martin said. "I gave my life to the program and developed tremendous relationships from an administrative standpoint, to the fans and obviously the players. I love all of them. "Our program was about sharing love, trust and building the community, so I appreciate everything and that they gave me that opportunity, which I don’t take for granted."